If the Gospel of Mark Condemns Peter, Why Do We Sympathize With Him? Especially since reading Theodore J. Weeden’s Mark — Traditions in Conflict, and several other works influenced by Weeden’s thesis, I have tended to assume that the Gospel of Mark seeks to denigrate Peter and the Twelve. They are nothing but failures, “obtuse and wrongheaded” (John Drury’s phrase) in every way. Was the author of the gospel (let’s call him Mark) firing shrapnel at Peter and his associates as part of some sort of ideological battle involving Paul? But if Mark wanted to condemn Peter then why is it so easy to read the gospel and feel sympathetic towards him? Are we really unconsciously reading Mark through the later evangelists? Before continuing, I must admit that I am conscious of the fact that I am relying entirely upon the Gospel of Mark as we have it in its canonical form and that the original composition may well have contained significant differences. Be that as it may, to continue…..
Finn Damgaard raised and answered my question in “Persecution and Denial – Paradigmatic Apostolic Portrayals in Paul and Mark”, a chapter at the end of Mark and Paul, Comparative Essays Part II. For and Against Pauline Influence on Mark (2014). He appears to be more “rounded” as a character than the others in his arguments with Jesus and his three denials and subsequent tears. But notice how the author also leads us to sympathize with Peter. Peter may be a foil to Jesus but he is not portrayed as wicked. Mark keeps the readers on Peter’s side by letting the readers see into Peter’s well-meaning nature, his good intentions and genuine bafflement and tearful remorse over his most serious failures. His tears may be seen as indicating a growing self-knowledge, and the audience may assume that he now sees clearly his own failings and shortcomings. He remembers that Jesus had predicted that he would deny him and that he had himself asserted that even if everyone else would become a deserter, he himself would not (Mark 14:29). In both these scenes, however, the omniscient narrator uses an inside view in order to gain the audience’s sympathy for Peter.14 Though Peter fails in his endeavours, the result is not, in my view, that the listeners dissociate themselves from him. On the contrary, it seems to me that they become painfully aware of how difficult it is to be Peter. Just as in the transfiguration scene, Peter fails in his endeavours, but that does not mean that the listener becomes estranged from him. In my view, the author’s use of the inside view has the opposite effect: the listener will now begin to with Peter. The readers are informed by the omniscient narrator that Peter’s failings are not willful but arise from genuine weakness. In this way the author elicits sympathy for Peter, not anger, in the readers/hearers of his narrative. At the end of the gospel the narrator also shows that there is continuity between the readers’ sympathy for Peter and Jesus’ final assessment of him. In the final reference to Peter the suspense (if there ever was such a thing) concerning his fate is resolved. Peter is not cursed; on the contrary, he is, once more, singled out from among the other disciples (Mark 16:7) and asked to follow Jesus, who is headed for Galilee. The reference to Peter in Mark 16:7 could also be read as a subtle reference to Peter’s function as the first witness to the resurrection (compare 1 Cor 15:5 and Luke 24:34). Though Mark’s portrayal of Peter primarily focuses on his mistakes, the narrator does not turn his readers against Peter, nor does he portray Jesus as someone who parts company with Peter. Damgaard follows Bauckham’s argument in suggesting the possibility that Mark is subtly setting up Peter as the source of the tradition being told in the gospel. Perhaps, but even if the author did not have such a plan in mind that was clearly the effect of his sympathetic portrayal of Peter as the lead disciple. Traditions soon emerged that Peter drew upon his recollections to dictate the gospel to Mark. But why would Mark present Peter as a failure, even if sympathetically? Damgaard turns to the influence of Paul’s letters, here. Paul himself used to loudly advertise his “failure” before his conversion. Not that Paul ever expresses any hint of genuine remorse or a guilty conscience. Indeed, Paul appears to even boast in his “worthless” life before being called by God. It is a rhetorical device. The same has been used by countless Christians in their conversion stories ever since: look how bad and lost I was, so you can now see how wonderful Jesus is and what he can do! All power to Jesus! Paul’s reference in Galatians to his former lifestyle is his way of defending the point made in Gal 1:12 that his gospel did not come from a human source, but from direct revelation of Jesus Christ. Paul does not refer to any guilty conscience because of his persecution of the church. Instead, his portrayal is meant to present himself in accordance with the fundamental theme of the letter, namely that “what is low and despised in the world” was chosen by God (I Cor 1:28). As is well attested, Paul’s “biography of reversal” [John Howard Schütz’s phrase] was developed further in later Christian literature such as Ephesians, Colossians, and the Pastorals. As Martinus C. de Boer has argued, the picture of Paul as the “redeemed persecutor” becomes paradigmatic for all Christians in these letters. In I Timothy, for instance, Paul is portrayed as the prototypical sinner and receiver of God’s grace (1 Tim 1:16). Paul’s self-portrayal as a persecutor of the church has here been generalized. It is never specified what it is that he had persecuted and there is no mention of his Jewish past. Instead, it is claimed that Paul was a “blasphemer” and a “violent man” (1 Tim 1:13), both of which are common entities in catalogues of vices. By transforming Paul’s offence, his persecution of the church, into more general vices, the author made Paul’s story applicable to his Gentile readers. Paul became a model with whom they could identify. For just like Paul, the converted Gentiles had to abandon their wicked ways and give their lives to the service of virtue. According to Hultgren, “Paul does not understand persecution as a procedure which ends in the death of the victim”.” He does not himself claim that he persecuted the church “violently” as καθ’ ὑπερβολὴν (Gal 1:13) has been translated in the NRSV. The expression probably refers not to the intensity of the persecution, but rather to the intensity of Paul’s zeal (see also Phil 3:6). Luke not only exaggerated Paul’s brutality in order to emphasize God’s transforming power, the exaggeration also creates an important contrast between Saul the persecutor (Acts 9:1-2) and Paul the persecuted (Ac!S 9:23-29): from now on Paul is persecuted for the same reasons as those for which he had himself persecuted.” While in the first account of Paul’s ‘conversion’ Luke focuses on the transformation of Paul: his change from persecutor to persecuted, Luke turns to an autobiographical discourse in the two other accounts of the ‘conversion’. As Landolt has emphasized such a turn indicates “a stronger focus on Paul’s character”. Paul here recalls the circumstances of his own ‘conversion’ in order to appeal to his listeners to recognize the need for repentance (Acts 26:19-20, 29). Luke thereby turns Paul into a paradigmatic figure by making his journey of conversion “representative of the conversion of all believers” (Landolt 2012, 307). Finn Damgaard rejects attempts to bracket Peter with the thoroughly negative portrayal of Jesus’ family in the Gospel of Mark. Peter is a character singled out for attention and sympathy. The author has applied the same psychology that Paul used in his letters. Pre-conversion failure is all the stronger testimony to the source of one’s post-conversion authority. Damgaard accepts the view that Mark may well have been a “Paulinist”, but adds that that did not set him up in opposition to Peter despite Paul’s argument we read about in Galatians. (I am reminded of 2 Peter’s conclusion that had Peter declaring Paul to be his “beloved brother”.) If so, then according to Damgaard Mark is declaring the joint authority of Peter along with Paul, not unlike the plan of the Book of Acts. If we go this far with our interpretation, then our canonical Gospel of Mark becomes a thoroughly orthodox narrative on a par with the Book of Acts and the later letters claiming to be authored by Peter. Posted on 2017-08-08 05:05:24 GMT+0000 by Neil Godfrey. This entry was posted in Biblical Studies, Paul and His Letters and tagged Gospel of Mark. Bookmark the permalink. Did Mark “take sides” at all? It is entirely possible that Mark’s chief interest was the diversity of reactions to the Christian revelation as a phenomenon in its own right. That is what’s on the page, with about 100 individual characters, 60 of them speaking parts, all told in about 11,000 words. Diversity of Christian reaction is among Paul’s themes, but not one of Paul’s advocated positions. That Mark may well have mined Paul for story ideas is clearer than what Mark thought, if anything, about Paul’s specialist positions. One character in particular smacks of being Paul’s surrogate. The scribe of 12:28-34 who warms to Jesus, and vice versa, does little “better” than any of the twelve. Whether the scribe is supposed to “be” Paul or not, he invites doubt that Mark thought somebody “like” Paul would have outperformed Peter (or Herod, for that matter) given the opportunity. Both Peter and the scribe mean well. Whether or not Mark was a Christian, it is plausible that he recognized that making a proper response to a son of a god (whether Zeus’ or YHWH’s) is a difficult and delicious problem. The dramatist needn’t advocate any unique solution to the problem to give his presentation life and grit. After all, the possibility that Mark wasn’t a pro-orthodox narrative is very low and beyond our expectations. The proto-Catholics could not know what a Paul meant really, but they saw very well the theological point behind any Gospel, and acted accordingly. Maybe. But according to Clement of Alexandria, the Basilidians claimed that Glaucias, the teacher of Basilides, was a interpreter of Peter, and Peter is in Marcion’s Gospel clearly a more positive figure than in GMark. Do you have particular passages in mind re Peter in Marcion’s gospel? I hadn’t thought of Peter there — I’d be interested to compare and follow up if possible. The Gospel of Mark is a strange mix of heterodoxy and orthodoxy and sometimes disjointed narrative, suggesting to me a likelihood that what we read today is not what the original “Mark” wrote. I found Dykstra’s book totally unconvincing in its claim to find a Paulinist tendency in GMark: one of those books, in fact, whose arguments to its thesis are so weak they tend rather to bolster its antithesis! On the other hand, I see GMark as rigorously anti-Petrine. 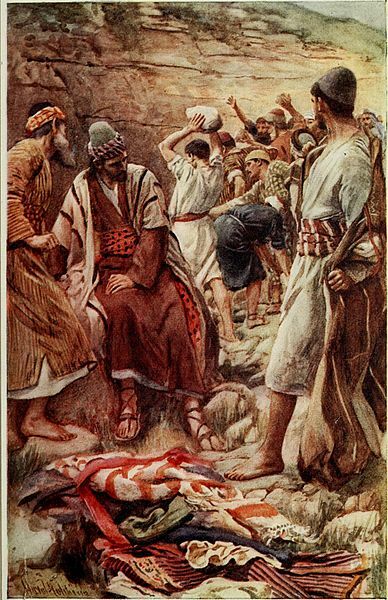 What seals this for me, on top of all his failings, is that Peter (“Stone”) and his failing faith narratively exhibit the failure of the seed that falls on stony ground in the parable. There is no redemption there: “because it had no root it withered away”. Even though Peter is supposed to meet the resurrected Jesus in Galilee, there is no reason to think he will ever get the message via the women. Mark may well be sympathetic with the failings of those who fall from faith through fear, but he is scarcely recommending Peter as a leader. If GMark is both non-Pauline and anti-Petrine, then I would suggest its origins are simply a mystery at this point. We don’t know enough about the earliest Christian movements to place it. I also like Mary Ann Tolbert’s argument about Peter representing the rocky soil of the parable. I don’t believe it means the end is terminal for Peter, though, for the reasons set out in the above post. You have expressed your alternative view and it is indeed one I have held for a long time, but you have not engaged with the contrary arguments that I presented above and that have given me cause to reconsider the view you have expressed here. Firstly, I would suggest that if Mark’s portrayal were meant to be sympathetic, it would look more like the versions of the story we find in the other Gospels. This seems to imply that the testing of Peter’s faith will be an instructive and constructive experience for him in the end. Jesus is on his side in this struggle, and Peter will be the better for it when he has come back to faith, and will have a leading role because of it. When we look back at GMark, we don’t get this positive contextualisation of Peter’s failure, one that Luke added as if he were aware that he had to demonstrate the interpretation he wanted the reader to put on the incident. The fact that Mark did not direct the reader in this way may suggest he did not intend Peter to be redeemed, and Luke’s rewriting may suggest he was consciously challenging a received interpretation. Similarly, GJohn 13: “you will follow afterward”, and GMatt 26, “after I am raised up, I will go before you to Galilee.” Both put redemption explicitly into Jesus’ warning of betrayal. If GMark 16 is doing a similar thing with the words of the young man, then it made a strange ending to leave the message undelivered and Peter’s eventual reunion with Jesus uncertain. Other evangelists sensed that something was wrong with Mark’s narrative and corrected it; this seems to indicate that some incorrect message was being drawn from it by rival Christians. Peter’s failings are much more serious than Paul’s. If it weren’t for the later Gospels’ redemption of Peter, one would have called them fatal to his apostleship, although it is interesting that they did not simply delete the episode entirely. Since Peter’s failings so severely violate Paul’s principles, one might conclude that the betrayal story was too well known to be expunged; it could only be massaged. Thirdly, I would reiterate my point that what is open to sympathy in a human being, is not necessarily open to sympathy in an apostle. GMark might possibly intend to stir sympathy for the failings of Peter as a man: but as a pillar of the faith? That would seem to require the sort of re-contextualisation that the later Gospels provided. If GMark is really about the redemption of Peter, then it is seriously understated and underpowered, as we may judge from the other Gospels and Paul. Thanks for addressing those points. I respect that. My own view I slightly elaborated in my reply to Bob Jase below. There can be little denying the ambiguity and open-endedness of the conclusion of Mark so I understand your point on that score. This returns me to my other view that the gospel is not really biographical at all but symbolic. It is a theological tale conveyed with allegorical action. It makes no sense read literally — so much is simply unnatural and bizarre if read that way, starting from the spirit “driving” Jesus into the wilderness and the first disciples simply getting up and following the newcomer Jesus merely at his command, their unnatural stupidity and forgetfulness, crowds coming and going as the plot demands, etc. etc. etc. right through to the bizarre ending. By eliciting sympathy with Peter as a person the author was involving the audience to lead them to identify with Peter, and to complete his right conclusion in their own lives. Sorry for rambling on at a tangent to your own response. I took the opportunity to work out the above thought a little by typing it up just now. To tie my reply back to your own comment, I was thinking in particular of your point that though the author may create sympathy for Peter the man he does not do so as an apostle. I agree. The Jesus in the gospel is a human Jesus, and I think of Paul’s “we have not known Christ according to the flesh”. The power and change comes only with the spirit Christ. I think there’s a question about whether fear is something to sympathise with or not. “He who would save his life will lose it.” GMark identifies fear repeatedly as the factor that weakens faith. Peter may be a readily relatable figure, but for all that he is still a caution against the way we should not let ourselves go. A frightened man cannot lead the faithful. The lack of alternative leaders offered by GMark, and the valorisation of local and minor and anonymous characters whose faith is immediate and unquestioning and fearless, makes me wonder if GMark was an argument for a democratisation of the faith, a dethroning of the apostles from their claimed status. Perhaps the ending is meant to inspire you to be less like Peter, and receive Jesus like a fearless child. I certainly agree that our author sets out Peter’s failings as a warning and lesson to readers. Even today sympathetic readers of the gospel (believers) will say how much they love Peter because he is such a failure and that gives them hope. I suggest it is not because he is a failure, per se, but because his failings are explained as being all too human. Are readers/believers responding the way the author (final redactor?) intended? … or receive Jesus like a demon or a Gentile, the only ones able to recognize Jesus’ true nature. The disciples are continually dumbfounded; the priests and scribes continually perplexed as to — who has such authority? From where comes such power? 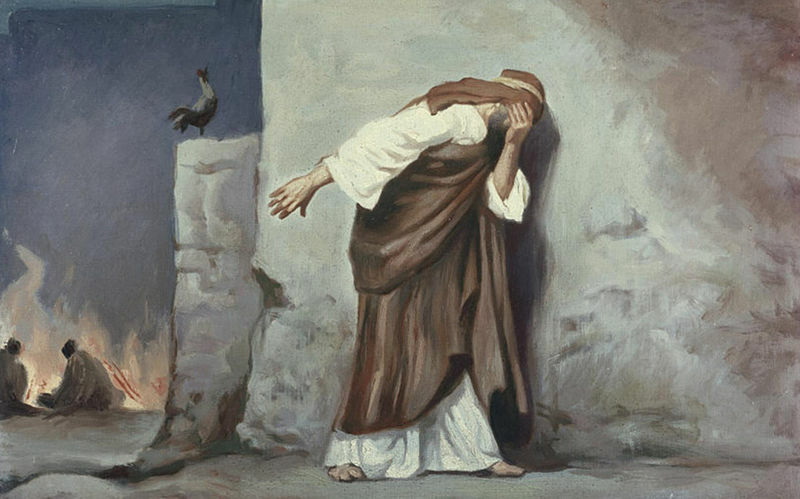 Notwithstanding the Roman church’s rehabilitation of Peter as a morale booster for stumbling, doubting believers, I see him originally written as a yet another failure among many. One last chance opens for Peter to ‘get the message’ (16:7), but that message is never delivered (16:8). Peter is the closest thing to an actual human character in the story, he has a backstory – who else can one sympathize with? Some disciple who makes a cameo appearance? An unnamed demoniac? The blurry masses of supposedly devoted followers who immediately turn on Jesus for no discernable reason? Really Peter wins by default. Agreed. Peter is simply there. You hit the bullseye, in my view. The author gives us very human reasons (apologies) for Peter’s failure: he was frightened and he did not know how to answer or what to say. Then he weeps when he recognizes his failure, and Jesus tells him that he knows his “spirit is willing”. He tells Jesus he has given up everything to follow him. Even when Jesus calls him Satan it is in response to Peter’s expressing a very human concern to save Jesus physically from harm. Peter is a more “human” character than even Jesus — Jesus is merely a tag name to be associated with certain words and deeds. I have said before that I think the gospel is not even “about” Jesus for that reason, but I don’t know if that is going too far. The denial of Peter (”I don’t know that man” 14:71) may be also a way to persuade Christians who were rather reluctant to accept the new Gospel portrait of Jesus. They would have said really that they didn’t know no Jesus prophet of Galilee. Hence ”confirming” a posteriori that they were well worthy heirs of that Peter who said ”I don’t know that man”. A clear source of embarrassment, for them, that moved them, velim nolim, to accept the Gospel Jesus. In this sense, just as the interpolation of Paul persecutor was a Catholic politics to coopt paulines, so the denial of Peter was a Catholic politics to coopt ebionites and/or followers of the historical Pillars. According to Hultgren, “Paul does not understand persecution as a procedure which ends in the death of the victim”.” He does not himself claim that he persecuted the church “violently” as καθ’ ὑπερβολὴν (Gal 1:13) has been translated in the NRSV. The expression probably refers not to the intensity of the persecution, but rather to the intensity of Paul’s zeal (see also Phil 3:6). the typical missionary zeal of the heretic preacher (as the Gnostic paulines were in the eyes of the proto-Catholics). the typical sincere answer of a Jewish-Christian unaware of the Gentile introduction of Jesus of Nazaret. In contrast to Mark 8:27-29, in GThomas 13, Peter mistakenly views Jesus a “righteous angel”, whereas Thomas is the one who truly understands. And all the names involved carry pertinent symbolism: “saviour”, “rock/stone”, “twin”. That of itself does not confirm non-historicitity — the “tradition” says that personal names were changed for followers — but it does open up other possibilities. Indeed. Symbolic character names point to symbolic characters. This distinction has over the millennia been glossed over then forgotten, but at the time, I suspect it would’ve been very apparent, and Peter considered blind to Jesus’ true nature. Mark portrays Peter and the disciples not only as obtuse, but also as fearful (Mk. 9:9) and weak (Mk. 14:37-38). True, due to the ambiguity at the end of Mark’s Gospel, it is unclear what reaction he was hoping to elicit by this portrayal. But if Mark was a Paulinist, as appears to be the case, the next best place to turn to for guidance would be the letters of Paul, not the later gospels or Acts. With the letters in view, Peter’s fear and weakness in the Markan gospel lines up with the fear and weakness he displayed in regard to Paul and his gospel. In Galatians 2:12 Paul does not say Peter was evil. He says Peter weakly caved “because he was afraid of the circumcision party.” And later in the same letter Paul accuses the Judaizing teachers not of being evil but of trying to “escape the persecution that awaits those who preach the cross of Christ” (Gal. 6:12). If Mark is a Paulinist, then, he may simply be projecting that fear back into the ministry of Jesus. Yet in Galatians 6:12 we read that those fearing persecution are also requiring gentiles to be circumcised. It is difficult to think of Peter in this camp, is it not? Gal. 6:12 says the Galatian Judaizers were “putting pressure” on the Gentile believers of Galatia “to practice circumcision.” In Gal. 2:14 Paul says something similar about Peter, that he was “putting pressure” on the Gentile believers of Antioch “to practice Judaism.” This practice of Judaism, according to a number of commentators (e.g., Betz, Longenecker, Holmberg, Nanos), would include circumcision. Note that this inability to share a common table is not necessarily something the Gentile believers could have fixed simply by observing Jewish food laws. In Galatians Paul doesn’t say anything about food laws. In the eyes of the circumcision party, the problem may have been simply that the Gentile believers, since they were uncircumcised, were by that fact still deemed in some way unclean, profane. In Gal. 2:15 Paul refers to the contrast: “We Jews by birth” not “sinners from the Gentiles.” Later Acts will have God intervene to correct this attitude, making Peter say to Cornelius: “You know that it is unlawful for a Jew to associate with, or visit, a Gentile, but God has shown me to call no one profane or unclean” (Acts 10:28). I really like this post. It shows that our views are based on interpretations und that different interpretations are possible. For example, I agree that one can understand the scene of Peter’s sleeping at Gethsemane as Damgaard did, if the verses are singled out and plucked out of the broader context („the omniscient narrator uses an inside view in order to gain the audience’s sympathy for Peter“). One may just think about Peter: Human, all too human. But if we read the story against the background of Mark 13:34 than it disqualifies Peter as the „doorkeeper“. Mark 13:34 It is like a man going on a journey, when he leaves home and puts his servants in charge, each with his work, and commands the doorkeeper to stay awake (grēgorē). 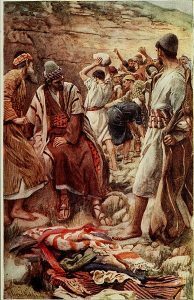 Mark14:37 And he came and found them sleeping (katheudontas), and he said to Peter, “Simon, are you asleep (katheudeis)? Could you not watch (grēgorēsai) one hour? Furthermore, if we read the story against the background of 1 Thessalonians 5 it would be a rather harsh critique. 6 So then let us not sleep (katheudōmen), as others do, but let us keep awake (grēgorōmen) and be sober. 7 For those who sleep, sleep at night, and those who get drunk, are drunk at night. 8 But since we belong to the day, let us be sober, having put on the breastplate of faith and love, and for a helmet the hope of salvation. 9 For God has not destined us for wrath, but to obtain salvation through our Lord Jesus Christ. Btw, in the same way as Damgaard one could interpret the figure of Herod in GMark. Mark used there also „inside views“ and „excused“ Herod in some sense. But I assume that no one would claim that Mark elicits sympathy for the murderer of John. Interesting comparison. We don’t feel sympathy for Herod as the murderer of John because his act is so abominable and criminally weak. His murder of John does not result in any overall good like salvation for many, etc. But we do feel some understanding for what led him to act against his own principles, even if we don’t excuse him in the end. We wish he had the courage to get rid of his wife instead. In Mark, Peter, James & John repeatedly err together, disappointing Jesus. It seems telling that these same three disappoint Paul in Galatians.